On Wednesday of Holy Week, we'll once again add Tenebrae to the wide selection of worship opportunities made available during perhaps the most solomn week of the Church year. The great three days (Eve of Good Friday or Maundy Thursday, Good Friday, Holy Saturday and Easter Day) are known as "the triduum." An enormous amount of tradition and history informs modern practices where Tenebrae is celebrated. The following excerpts of the Tenebrae Wikipedia article references at least some of the detail. The principal Tenebrae ceremony is the gradual extinguishing of candles upon a stand called a "hearse." In liturical history, eventually, the Roman Rite settled on fifteen candles, one of which is extinguished after each of the nine psalms of matins and the five of lauds. The six altar candles are put out during the Benedictus, gradually also reducing the lighting in the church throughout the chanting of the canticle. Then any remaining lights in the church are extinguished and the last candle on the hearse is hidden behind the altar (if the altar is such as does not hide the light, the candle, still lit, is put inside a candle lantern), ending the service in total darkness. 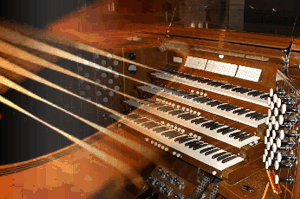 The "strepitus" (Latin for "great noise"), made by slamming a book shut, banging a hymnal or breviary against the pew, or stomping on the floor, symbolizes the earthquake that followed Christ's death, although it may have originated as a simple signal to depart. After the candle has been shown to the people, it is extinguished, and then put "on the credence table," or simply taken to the sacristy. All rise and then leave in silence. Some Anglican churches celebrate Tenebrae on Wednesday of Holy Week, although in various forms, thereby preserving the importance of Maundy Thursday and Good Friday observances. The Episcopal Church in its Book of Occasional Services provides for a single Tenebrae service on Holy Wednesday in the evening. 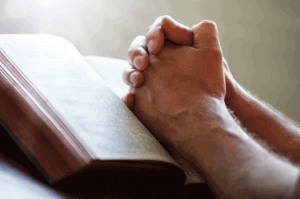 That form preserves the number of nine Tenebrae lessons, each followed by a responsory. The majority of parishes within the Anglican Church of Canada do not routinely celebrate Tenebrae, and the Anglican Book Centre does not publish any service explicitly for Tenebrae. 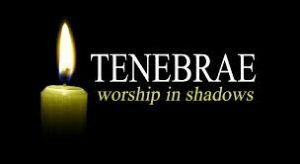 Parishes that do celebrate Tenebrae follow a variety of practices. 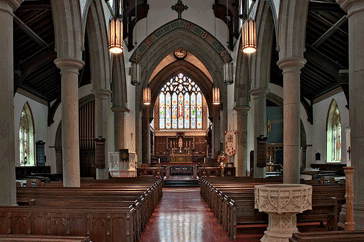 The Church of St. Mary Magdalene (Toronto) is notable for the excellence of its music, of which the musical Tenebrae services are exemplary. Christ Church Cathedral (Fredericton) uses Tenebrae in a sung traditional language form on the Wednesday evening of Holy Week which includes lessons from Jeremiah with responding psalms, the fourth being from John 17, and Benedictus. At the Church of the Epiphany (Oakville) Tenebrae is described as the reversal of the Advent wreath: "starting Lent with the brightness of six candles, the darkness grows as a candle is extinguished each week in anticipation of Jesus dying on the cross on Good Friday." This abbreviated Tenebrae liturgy begins worship services on Sundays during Lent. The Sisterhood of Saint John the Divine have their own liturgy, "The Order of Tenebrae," published in 1933.